They might be young but they’re passionate about looking after the environment, starting with their local park. 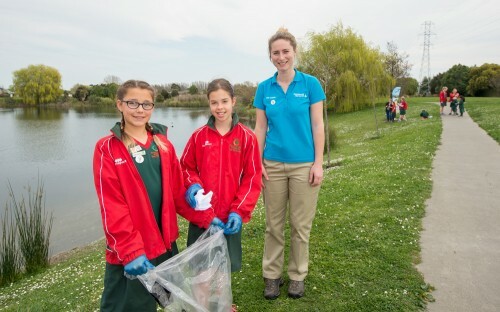 A group of children from Oaklands School and Aidanfield School, have taken part in a clean-up day at Westlake Park in Halswell during Keep New Zealand Beautiful Clean-up Week. They were joined by 10 pre-schoolers from Wales Street Kindergarten in picking up rubbish. Christchurch City Council Park Ranger Amanda Black and other Council staff helped supervise and Sandra Wallace from Birds New Zealand spoke to the children about wildlife living in the park. Christchurch City Councillor Anne Galloway has been meeting with children from Oaklands School, Aidanfield Christian School and Seven Oaks School as part of a Junior City Council group to foster their interest in local government and the democratic process. The Junior City Council came up with the clean-up idea and last week they were granted $400 from the Halswell-Hornby-Riccarton Community Board to help achieve their other goals. Ms Galloway joined the clean-up, and said it was fantastic to see young people getting involved with their local community. The children are keen to design a sign informing visitors about wildlife in the park and how they can be protected by reducing pollution in the area. They would also like to make the park rubbish free so visitors take their litter away with them. All of the rubbish collected will be audited by the children so they can identify where it is coming from.